Could Depth Make A 1960 Comeback? John Wayne as Davy Crockett in 1960 referred to something or other being "dead as a beaver hat." Well, that's about where 3-D laid by that year. The process was chased off screens at least five years earlier. There had been attempts at revival, spotty and local-launched, but a wider public wanted none of it. 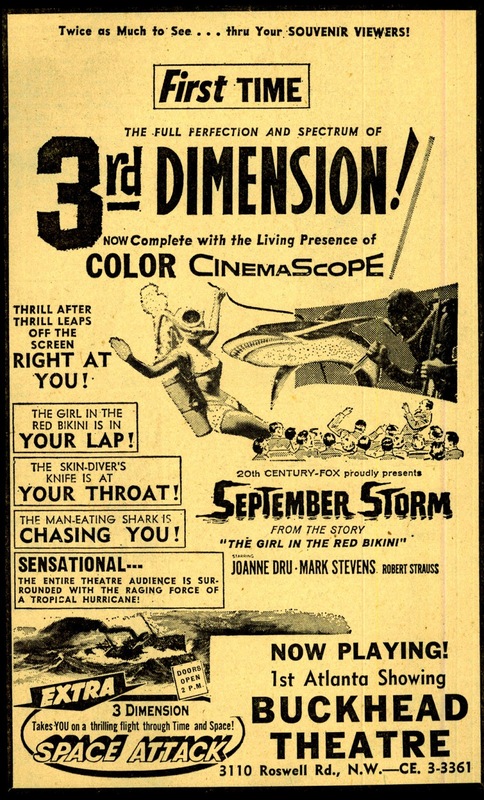 3-D had been branded a gimmick from beginning, carny appeal if that. Too many had trouble with the glasses, which even where projectors synched, met resistance of myopia patronage brought with them to seats. This got blamed on the process, management failing to warn that if you had any sort of vision limit, 3-D would exacerbate it. And why, they'd ask, was the picture so dark? We wonder the same with home projection where battery-powered goggles are necessary to watch. Flat screens work better, but manufacturers are dropping the 3-D option from newer models. Sometimes it seems stereo adherents can't win for losing. September Storm came out recently on Blu-Ray. It is a remarkable job of preservation by the 3-D Archive team of Bob Furmanek, Jack Theakston, Greg Kintz, and Thad Komorowski. September Storm had not been seen in depth from 1960 theatrical dates till these wizards got hold of it, elements being in expected rough shape. Now September Storm look lustrous, par for course of whatever 3-D Archive turns hands to. 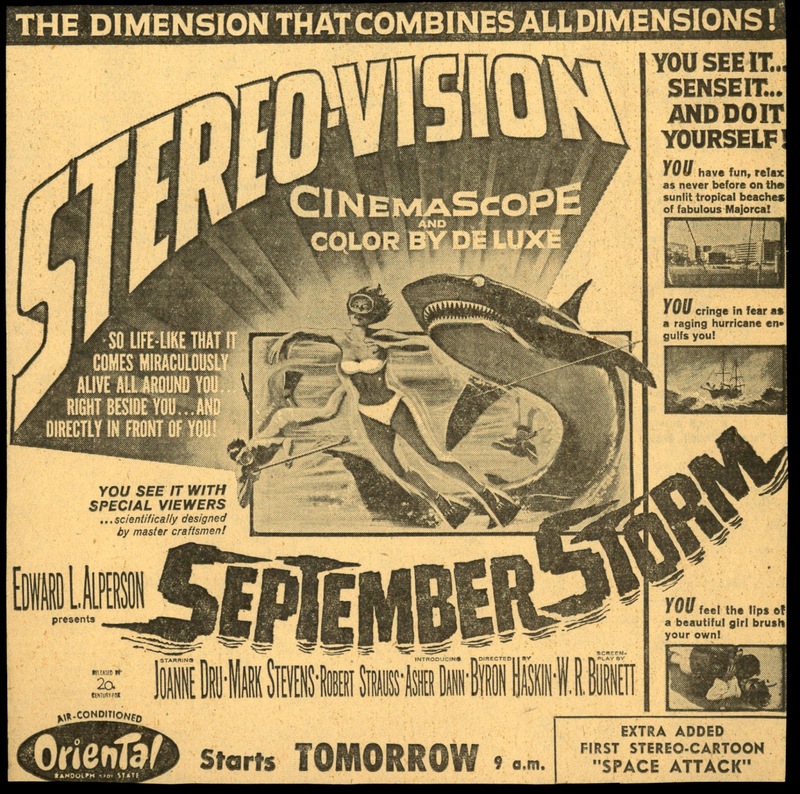 I always wanted to see September Storm because it was the only 3-D feature I knew of that was also in Cinemascope. Further draw was fact it seemed utterly lost. These first-run ads for Chicago and Atlanta are a recent come-across. Note ones for Chicago (the Oriental Theatre) don't even mention 3-D, opting instead for "Stereo-Vision" and "special viewers ... scientifically designed by master craftsmen." It's as though they were hawking an all new process, quite beyond old and problematic 3-D. Whatever the appearance --- September Storm took a swift $25,000 in its first Oriental week, $18K the second. Atlanta's Buckhead Theatre emphasized "First Time" linkage of 3-D with "Living Presence of color Cinemascope." Came the seeming oblivion of post-'60, TV runs (few) in full-frame, sans depth, and black-and-white besides in most markets. We're fortunate then, to have September Storm back, thanks to 3-D Archive. As one of the many who coughed up cash to enable this restoration I am pleased as punch with the results. The 3D makes this movie. So, was this when they finally got around to first releasing SPACE ATTACK? I'd need to defer to Bob Furmanek for an answer to that question. Saw Andy Warhol's disgusting FRANKENSTEIN in 3D shortly after its early '70s release, a nauseating experience which induced the worst migraine I've ever had. Haven't visited the Third Dimension since. Thinking of PhilharMagic, a cute 3D film attraction at Disney World. Basically, it's Donald Duck stumbling through a Disney hit parade with in-theater effects. The lady I was with was surprised that everybody in the theater had the exact same view; she thought she had the one seat where the duck floated directly in front of her. At one point we have a CGI Little Mermaid doing her number, and suddenly she's very convincingly within breath mint distance of the viewer. Very G-rated, of course, but the possibilities were immediately evident. Did SEPTEMBER STORM actually deliver a POV moment with "the Girl in the Red Bikini in YOUR LAP"? Actually, there's no girl wearing a red bikini that I saw. Still, it's a swell picture, and the 3-D is terrific. And by the way, I looked at Twilight Time's Blu-Ray of "Inferno" last night. What a show, and all that desert survival stuff in depth. Greenbriar visited this one before, but it sure stands up to repeat viewings, and how. And note to Brick --- I well remember the headache we both had from the Janus Theatre view of "Frankenstein." That was one of several occasions where I swore off the process, not realizing it was poor presentation that stymied the effect. This has not been the case with any of Bob Furmanek's 3-D rescues. All have been top quality, soothing to the sight ... and head. 3D never rang my bell, either in movie form or View Master. 3D properly presented is a gift to the eyes. I saw Warhol's FRANKENSTEIN 3D in Toronto. Got a MASSIVE headache. SPACE ATTACK is included in The 3D Film Archive's 3D RARITIES set. Everything in that set is must see.I have all of the late Ray 3D Zone's books so I really knew in advance what a gift Bob Furmanek and his crew were giving us in that set. Pity they could not come to reasonable terms for the Lumiere Brothers' 3D Films as who else is going o do them justice? When I got my field sequential 3D setup here I got every title I could in 3D. Combed the web with a fine tooth comb. Bought 2D to 3D conversions of titles I could not see in true 3D. Then I bought systems to do my own conversions. All of that pales beside seeing Real 3D. When we watch 2D films our eyes get strained because we are looking at a flat world. With good 3D I do not experience that strain. Flat images lack density. 3D images have density in spades. I use Peter Wimmer's Stereo Player, big screen projection and shutter glasses (the technology was invented by Lenny Lipton who put his royalties from his hit song PUFF THE MAGIC DRAGON into advancing 3D and, boy, did he advance it! Watching DIAL M FOR MURDER in 3D is seeing it as Hitchcock designed it to be seen. It is a whole different movie. Olive Films has robbed us of the chance to see Jerry Lewis and Dean Martin's MONEY FROM HOME in 3D. Kino Lorber are calling on The 3D Film Archive to restore 1953's THE MAZE to 3D. That really will be something to see! The love of the 3D Film Archive crew is palpable in every frame they restore. It's a shame Olive Films does not share that love. Thankfully, Kino Lorber does. SEPTEMBER STORM in wide screen 3D is a delight to watch. I was one of the people who signed up for the go fund me thing to support the restoration (my name's in the credits!) for this film I'd never heard of, but it seemed important that it should be preserved, restored and made available again. I received my Disc back in February and have enjoyed it very well since then. The underwater 3-D is where the film really shines. I wouldn't mind owning the soundtrack, too, if such a thing ever materializes. Regarding WARHOL'S FRANKENSTEIN, Paul Morrissey threw Colonel Bernier (the inventor of Space-Vision) off the set for taking too long with his set-ups. Bernier wanted quality, eye-strain 3-D with his outstanding system (see THE BUBBLE) and Morrissey wanted to film quickly. The result is a film with many severely mis-aligned shots that rip your eyes apart. It sat on the shelf for 6 years until Edward Alperson acquired the rights to release it with SEPTEMBER STORM. Making a 3D Blu-ray of Warhol's FRANKENSTEIN better be trusted to THE 3D FILM ARCHIVE as that is probably the only hope of correcting the film's mis-aligned shots. I dunno, my friends and I thought the 3D "Frankenstein" was a lot of fun. The effects were great -- no headache that I can remember. I seem to remember Frankenstein (or his assistant) taking a pair of ice tongs to someone's neck, with blood spurting everywhere. Another great scene featured two kids stuck in a closet with bats flying around them. The audience applauded that bit. Most of us got the headache. Yes, the movie is fun. That's why a proper 3D Restoration should be welcomed by its producers. I have it on Field Sequential and anaglyph 3D. Poor quality but fun. In regard to my last post I must add that I did watch a 3D version of HOUSE OF WAX around the same time, also at another theater in Greensboro, NC, and the experience was much more pleasurable, both visually and gastrically. In other words, I didn't go away with crossed eyes and rumbling bowels. The most effective scene for me in WAX was the sidewalk barker standing outside the titled museum, entreating the public to enter its doors and witness the tableaux of horrors that waited within. The guy was a real maestro. While the barker delivered his spiel, he was using a "flyback" paddle to attract the crowd's attention. It was child's toy with which I was familiar but inexpert in playing with myself, as I had begun being a klutz at an early age (I was equally unqualified with Duncan Yoyo's). Constructed of a thin wooden paddle stapled to a limp rubber band from which a red rubber ball dangled, I could never quite get the ball to recoil more than once in succession against my paddle, no matter how many times I tried. In sharp contrast, the barker performing outside the wax museum was wowing the bystanders and the theater audience with his flyback proficiency, as the red rubber ball sprang toward their faces, barely missing them. I remembered the reaction of my fellow audience members, jerking back in their seats to avoid being struck, including myself. It was a lot of fun. Did we go all the way to Greensboro for "House Of Wax"? I remember it was about 1971, and there were six of us in the car. It WAS a big deal to finally see "Wax" in 3-D after hearing about it all those years, plus seeing only TV versions which were flat, or worse, black-and-white. Remember renting HOUSE OF WAX in 16 for a college coffee house circa '71, was advertised in the catalogue as available for the first time in color! A LONG ANSWER TO A SHORT QUESTION: Affirmative. It was a bright, warm Sunday afternoon, as I recollect, when at least six of us cinephiles piled into your Ford, our destination eighty miles away, still in recovery from our weekly all-night Saturday poker games, played on the thinning green felt of an old billiard table inside the Finley Park Casino, where treacherous hands of "Gut" and Acey Deucy were dealt without mercy. I often lost a shiney shekel or two; others sometimes sacrificed a portion or all of their college funds. We smoked cigarettes and sipped Mad Dog 20/20 and Virginia Gentleman whiskey in honor of Bogey and Robert Mitchum, while the more bohemian members of our clique paid homage to New Age anti-heroes like Peter Fonda and Dennis Hopper and the rest of those easy riders that glided on a magic carpet fueled by cannabis and LSD. At least our hippie cohorts, both lads and lasses, had the common decency to retreat to the confines of their vehicles parked outside in the driveway for hurried tokes on skunky reefer (and hurried pokes if they got lucky that night), their steamy windows rolled up tight so as not to narcotize the rest of the neighborhood... Anyway, HOUSE OF WAX in 3D was in itself somewhat hallucinatory in its presentation on the big screen in Greensboro, though I wonder if some us, especially the aforementioned Aquarians, were truly cognizant of WAX's special effects?